I’m calling it now, the peacock cake is about to have a moment. I’ve been noticing more and more peacock motifs popping up in paper goods, jewelry, and home decor, so it’s only a matter of time before everyone wants a cake to match! These pretty chocolate peacock feathers have been kicking around in my brain for quite some time now. I was just lacking on my most precious resource to get them done – time. Ugh, summer! I love you so much, but you’re kind of high maintenance. I can’t complain, though. We’ve had an epic couple of months filled with traveling and fun. I wouldn’t trade that for the world. I’m just ready to hop off the party bus and get back into our routine. I truly can’t wait to see what everyone does with this technique! Use the color combo I landed on or mix things up with you’re own set of shades. As always, these techniques will work with coating chocolate (Candy Melts) or regular chocolate that’s been tinted and tempered. All of the chocolate design elements can be made well in advance and stored in an airtight container at room temperature. Don’t forget to tag me, so I can check out your gorgeous work – #erinbakes Oh, and if any of you wildly popular YouTube channels or social media video creators want to share this with their followers, call me. 💁‍♀️ Let’s work together and share the cake love. The supply list contains affiliate links, because that’s how people on the internet make money. We live in the future! Plug in the heating pad if you’re using it and set it to high. Using a heating pad makes working with melted coating chocolate or regular chocolate SO much easier! The one I use is relatively inexpensive and, the best part, can be unplugged and tossed in the washing machine. You can find that one here. Even though it’s machine washable, I still protect my heating pad with a paper towel before setting my chocolate on it. Making the chocolate pieces will require tapping a cookie sheet against your work surface, so move anything you don’t want jostled. Also, clear out a space in the fridge large enough to accommodate your cookie sheet if you’re working in a warm room. Line a cookie sheet with parchment paper and melt the royal blue coating chocolate in a heatproof bowl. Pour about a teaspoon of melted chocolate onto the parchment paper. Use a food-safe paint brush to spread the puddle of chocolate across the paper. I used the same brush from the brushstroke cake tutorial I created for The Cake Blog. I trimmed the brush to make a rounded edge, because I liked the look of the stroke it created better than the flat edge. After smearing the chocolate, quickly move back towards the rounded part of the stroke and slightly feather the edge. This helps give the brushstroke more of a peacock feather shape. Repeat this process as many times as you like. I used 10 feathers on my finished cake. Always make a few extra to account for breakage. Melt the lime green, yellow, and teal coating chocolates in separate heatproof bowls. Pour small amounts of each color, including the royal blue, into paper cones or piping bags. As you fill each bag, set it on the heating pad and top the whole thing with aluminum foil to keep the chocolate fluid. Pipe a small egg shape of lime green coating chocolate in the center of the largest part of the brush stroke. Next, pipe a smaller egg shape of yellow on top of the green. Finally, pipe a pea-sized puddle of teal in the center of the egg shape and a dot of royal blue on top of that. Gently tap the tray against your work surface to smooth the chocolate out. This one’s a little fuzzy, because taking pictures of melted chocolate is tough! I wish I had an extra arm. Use a tooth pick or skewer to pull a line through the two blue circles up from the bottom of the egg shape. Tap the tray again to smooth out the line. Allow the chocolate to harden completely before lifting the feather from the tray, about 10 minutes. Repeat the process to finish the rest of the feathers. Line the cookie sheet with a fresh piece of parchment paper. Pour one puddle of melted royal blue coating chocolate large enough to accommodate a 4-inch tear drop cutter. Pour a second puddle large enough for a 2 1/2-inch cutter. Tap the tray to smooth out the chocolate and drop the cutters onto their respective puddles. Making the shapes this way, instead of pouring the chocolate into the cutter, makes for a smoother edge and more level shape. Any excess chocolate can be saved and reused. Set the shapes aside to harden completely before using. Melt the white coating chocolate and repeat the same shape-making process with the 1/2-inch tear drop cutter. Allow it to set up and then repeat the process to make a second white tear drop. Melt the black coating chocolate and pour a small amount into a paper cone or piping bag. Set the bag on the heating pad until you need it. Add a few chips of black coating chocolate to the remaining melted white to make gray. Pop the large tear drop out of the cutter and set it aside. Pop out the smaller blue tear drop and set it on the parchment paper. Stick one of the white tear drops to the small blue tear drop using any of the melted chocolates (you won’t see the color used to adhere the pieces). Line the tear drops up so that the points are together. Let that set up for a moment, then flip it over and adhere the other white tear drop to the other side. Allow the whole thing to harden completely before moving on, just a few minutes. Pick up the peacock head and dip the point into the melted gray chocolate about 3/4-inch deep. Wipe off any excess on the side of the bowl and set the head back down on parchment paper to dry. Pipe a small black dot for the eye. Pipe another eye on the other side once the front is dry. Add three leaf sprinkles to the top of the peacock’s head using a few dabs of melted chocolate. Carefully lift the dried feathers off of the parchment paper. Smear or dab some of the extra buttercream onto the base of one of the feathers. 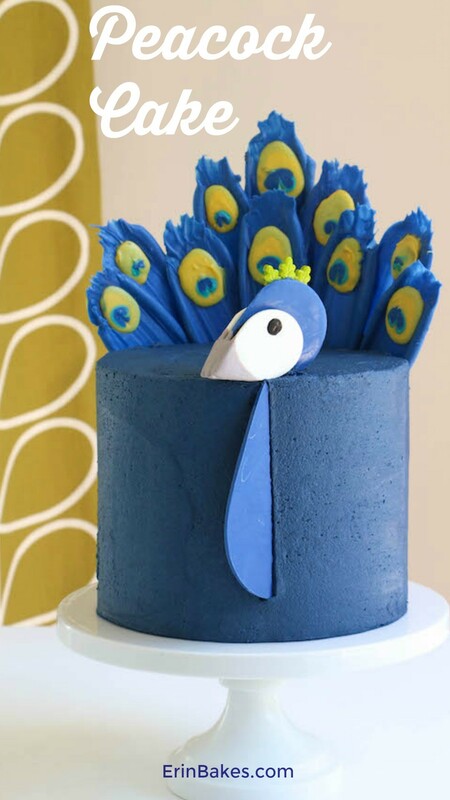 Stick the feather onto the side of the cake so that the pretty side is poking up over the edge of the cake by 2-3 inches. Use that feather as your center guide and place a few more feathers on either side. Add a second layer of feathers behind the first layer. Keep adding feathers until you’re happy with your plumage. Press the large blue tear drop into the cake (opposite the feathers) so that the point is touching the top of the cake. I tilted the peacock’s body slightly to the side so that it was more visible head-on. Set the finished peacock head on top of the body. Use a dab of buttercream to secure it if needed. Refrigerate the cake for 20-30 minutes to ensure everything is set in place.